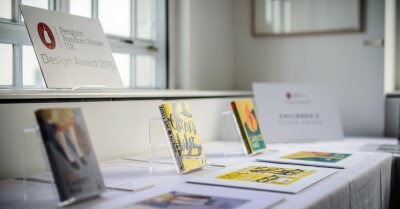 Three Communication Design students at Gray’s School of Art are celebrating after making the shortlist in an international book design competition. Lewis Copland (24) has been shortlisted in the Adult Fiction category; Kasia Serafin (29) in the Adult Non-Fiction category; and Andrea Karan (22) in the Children’s category of the Penguin Random House Design Award 2016. The final year students are up against nine other nominees in each category and will find out if they have won on June 22, with a four week work placement within Penguin Random House UK’s Design Studios and a £1000 cash prize up for grabs. The awards, which have been running for a decade, are aimed at encouraging the next generation of designers to use their talents to help tell authors’ stories and capture readers’ attention. The cover Lewis has designed is for Anthony Burgess’ ‘A Clockwork Orange’, with the design brief stating that originality is key and for entrants to avoid the obvious clichés. The title set for the Adult Non-Fiction category which Kasia has been shortlisted in is Caitlin Moran’s ‘How to Be a Woman’, while in the Children’s category Andrea took on ‘Emil and the Detectives’ by Erich Kästner. Lewis said: “Last year I won the Kelpies Design & Illustration Prize for the book ‘The Hill of the Red Fox’, so since then I’ve had a bit of a hankering to do more book cover competitions. When I went scouting for them, the Penguin Random House Design Award brief caught my eye, as the chance to redesign a book as iconic and genre-defying as A Clockwork Orange was far too good to pass up. Describing his design as “risque”, Lewis has produced a stylised and embossed representation of one of the book’s controversial scenes. She added: “Part of my self-directed honours year project revolves around the topic of body positivity and femininity. I found myself really enjoying working within this theme, so I was really thrilled once I found out that one of the briefs had a connection with what I was originally doing. It was a win-win situation. Caitlin Moran’s book is a super fun piece of writing, so I was more than happy to create a cover for it. Andrea said: “What primarily made me want to enter the competition was that I was already familiar with this children’s book – it’s a German classic and having grown up in Germany I instantly recalled my own childhood. Entries are being judged by three of Penguin Random House UK’s Art Directors as well as guest judges, print maker and illustrator Sanna Annukka, and singer, songwriter and author, Tracey Thorn. The winners of the Penguin Random House Design Award will be announced on Wednesday, June 22.